Hello, friends! I hope you had a wonderful Christmas! I don't know about you but it came and went waaaay too quickly for me. With Christmas behind us, we now look forward to ringing in the new year in just a few days! 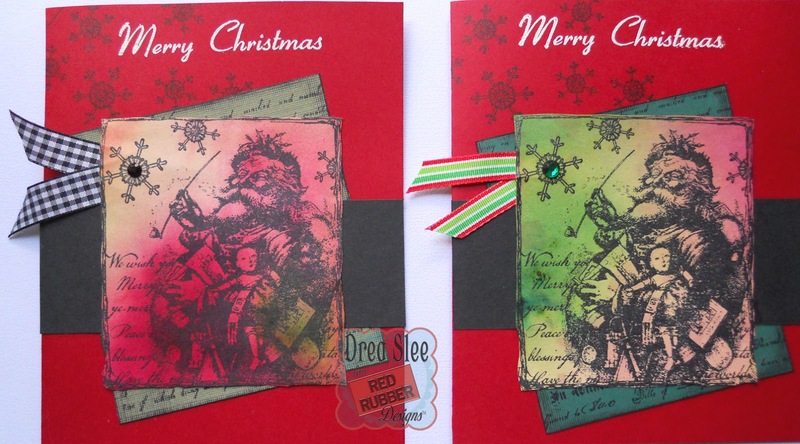 To celebrate the new year I created a card featuring two stamp sets from Red Rubber Designs. 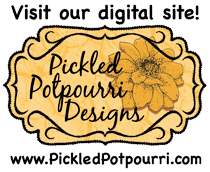 I pulled out a previously created background and stamped several images from the Lotsa Dotsa cling mount set in silver to mimic the idea of fireworks. 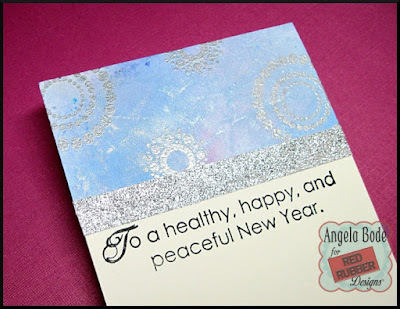 To finish off the card I added a border of glitter paper then I used one of the New Year's sentiments from Holiday Wishes unmounted stamp set. The background was created by painting Brushos then spritzing with shimmer spray. Next, I covered the inky mix with cling wrap and squished! In this angled view you can see a bit of the shimmer. My husband is home this year for New Year's and I am pretty excited about getting to spend the day with him. Leave me a comment and let me know how you plan to spend your New Year's day! 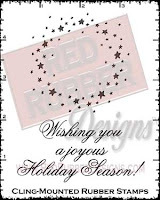 From all of us at Red Rubber Designs we hope you have a healthy, happy and peaceful New Year!!! 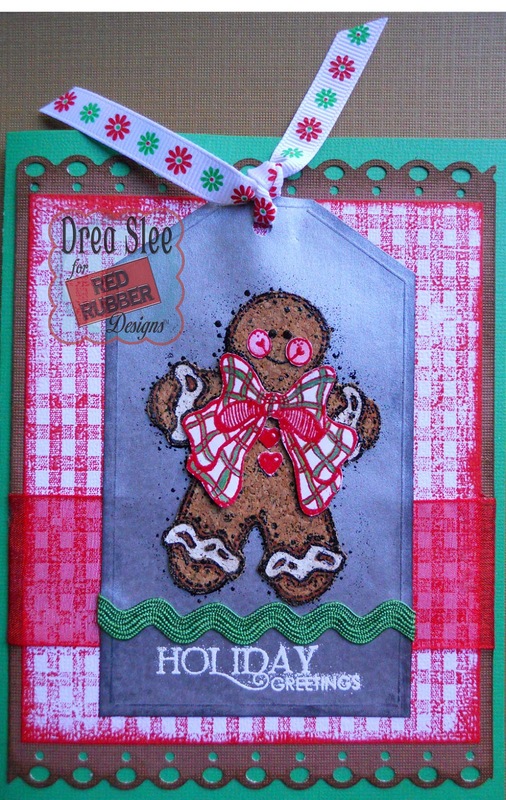 Holiday Greetings stampers! 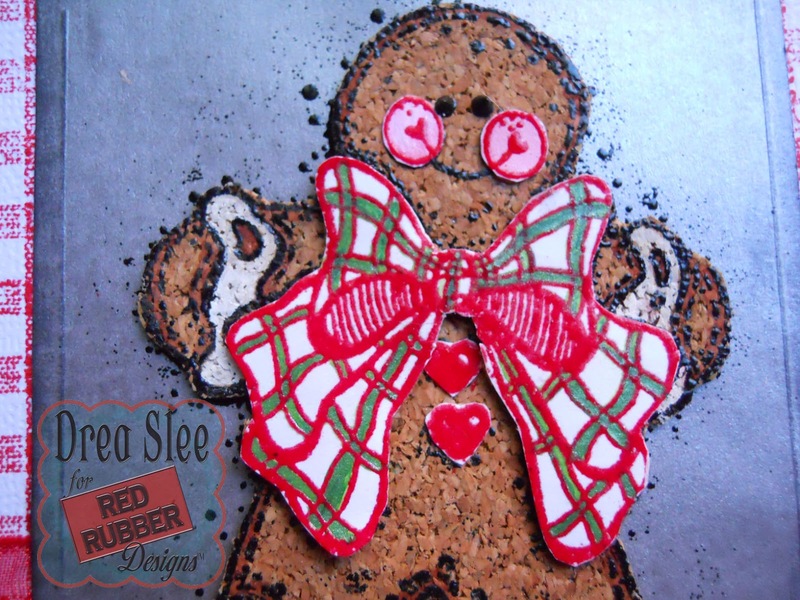 Today I'm spreading some cheer, with this adorable gingerbread man made with the Ginger Joy Cling Mounted Stamp from Red Rubber Designs! I embossed my image in black onto Cork Paper, which gave this gingerbread man the perfect texture! Then I colored the cork with some sprays and a paintbrush, using white paint for the icing. 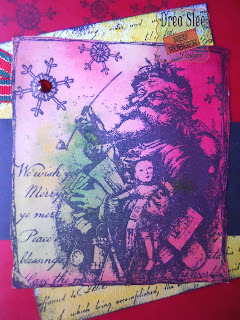 I embossed him again onto white cardstock using red embossing powder, and colored his cheeks and bow with sprays. After fussy cutting, I glued the pieces onto the cork, and dotted his eyes with black puffy paint. 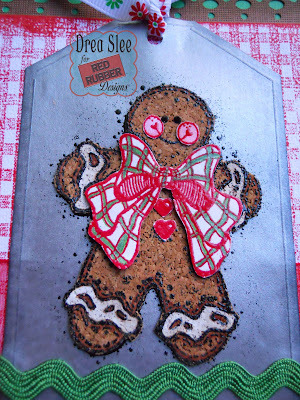 The tag was cut from a matte silver to mimic a cookie sheet, with embossed lines along the edges, made by scoring the back. 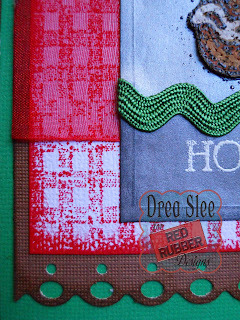 Then I embossed my image again onto the tag, to show the crumbs along the edges. 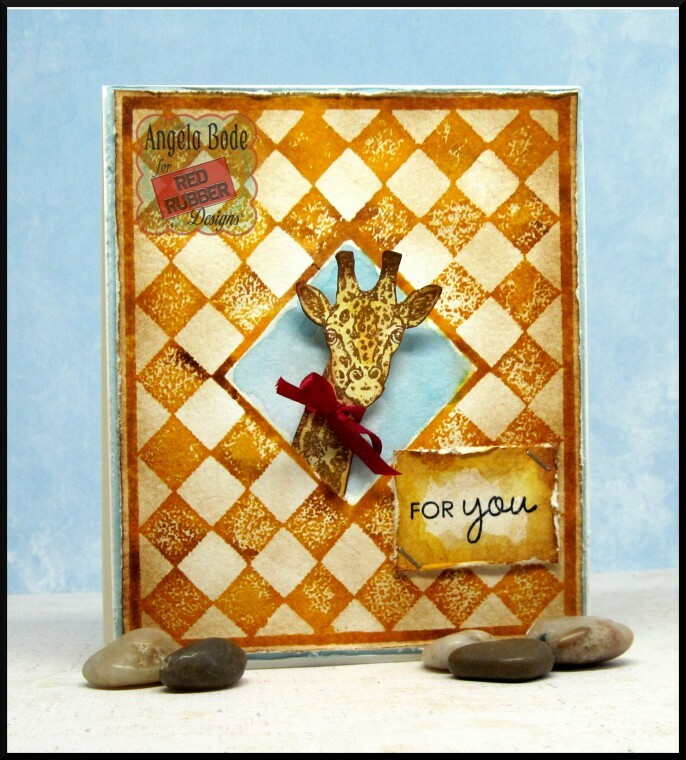 The sentiment was done in white using the Contemporary Greetings Unmounted Stamp Set, with some rick-rack over it. Finally, I finished it up with a punched hole and some ribbon. 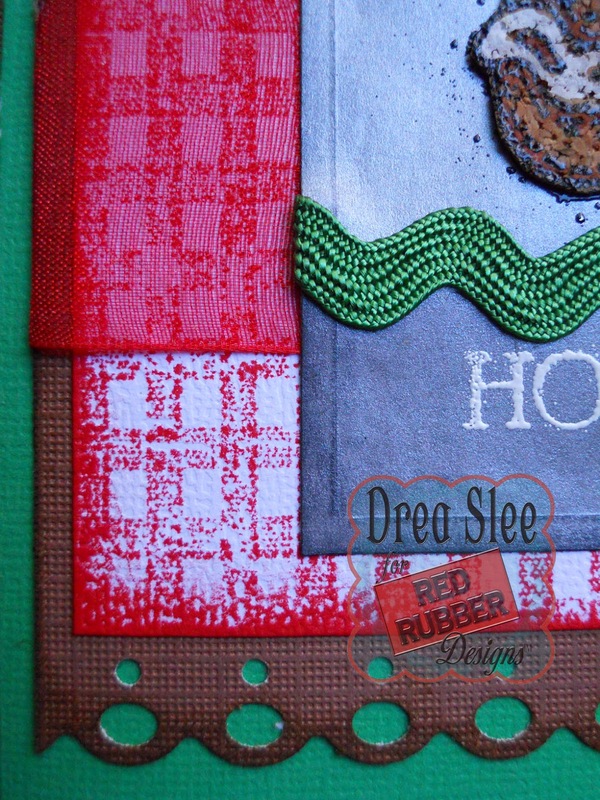 I love the background, stamped in red ink with the Gingham Background Unmounted Stamp! The sheer ribbon allows the pattern to show. Behind that, I punched the top and bottom edges of some brown cardstock from the DCWV Jewel Colored 8 X 8 Cardstock Stack, which was the perfect match for my gingerbread man! 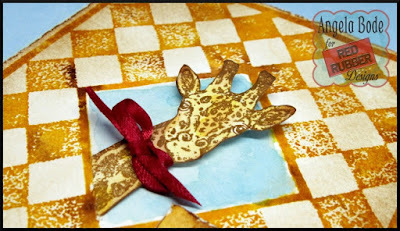 I made multiples of this card, just changing some of the ribbons on the tag. Happy Holidays! Hello! 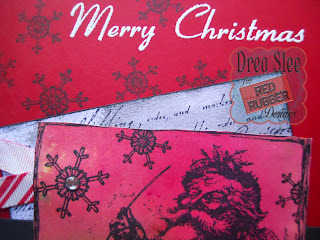 Today I am sharing a VERY non-traditional Christmas card featuring several stamp sets from the Red Rubber Designs store. It doesn't even have a "Merry Christmas" sentiment but it's is going to be my daughter's Christmas card this year. 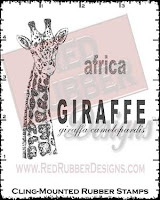 Check out this adorable Giraffe from the African Giraffe Cling Mount Rubber Stamp set. I cut a slit in the lower portion of the diamond frame and slipped the long neck through the slit. She looks like she is popping out of the frame! 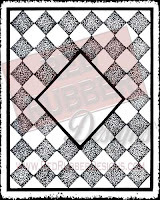 For the background, I pressed distress ink onto the Designer Diamonds Unmounted Rubber Stamp and spritzed with water, the textured diamonds add a distressed and vintage look to any project! 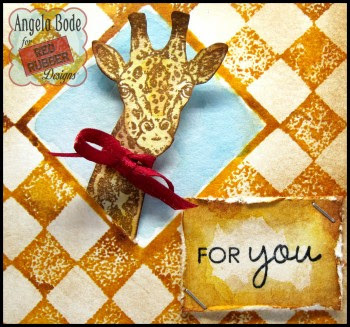 For the sentiment, I chose "for you" from the Sophisticated Sentiments Unmounted Rubber Stamp set. This sentiment set includes ten encouragement and celebration sentiments in a super cute font style! I came up with a giraffe card for my girl because she started calling herself a giraffe a few years ago when she began to surpass all of her friends in height. Ever since that time the giraffe has become her personal mascot! For Christmas, I picked out the cutest long sleeve shirt with a zentangle-looking giraffe on the back and I hope to buy her some giraffe socks! 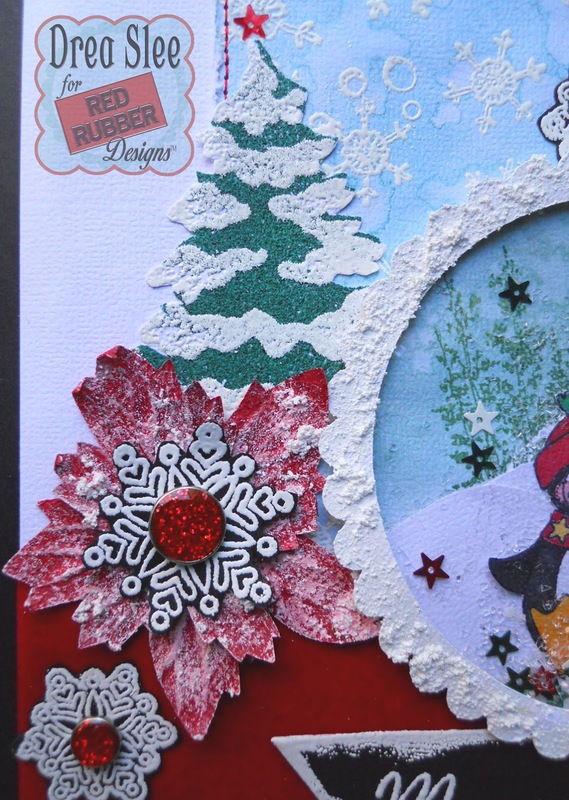 Have you created any Christmas cards this year that are tailor-made for the recipient? If so I would love to hear about it in the comments!!! Time is something there's never enough of in December! So I made a card set featuring the Vintage Santa Unmounted Rubber Stamp Set that's pretty quick to assemble once you get your papers ready. 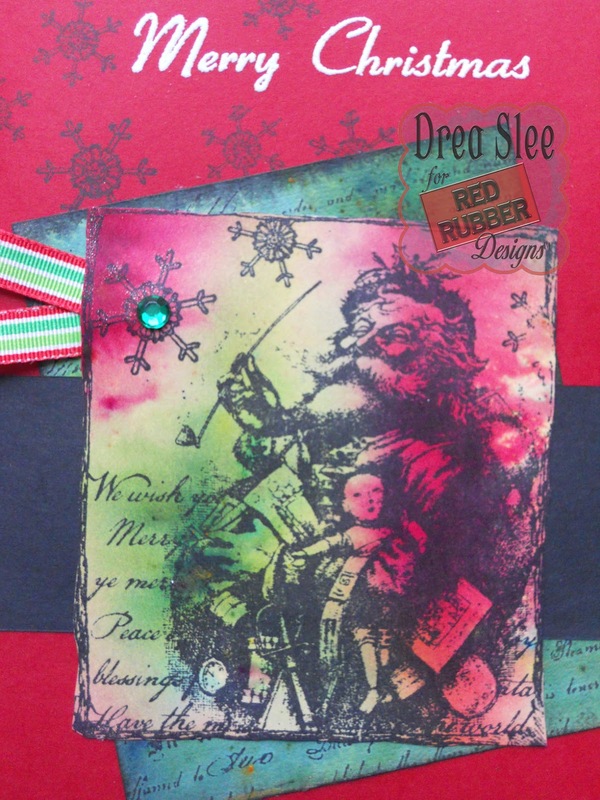 I just colored a sheet of 12 X 12 white cardstock with some Magicals, and filled it with my Vintage Santa image stamped with permanent black ink. That allowed me to make several cards using the same design, with each image being different and unique in the coloring. 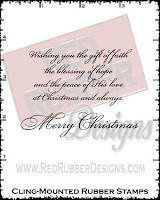 The Scarlet 12 X 12 Cardstock from Red Rubber Designs is the perfect holiday red, and I was able to make two cards from one sheet measuring 6" X 5". 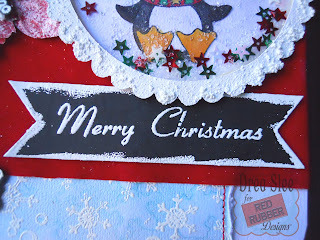 I added a strip of black cardstock to mimic Santa's belt, with a letter tucked into it, colored with sprays, and stamped with the Vintage Script Cling Mounted stamp. 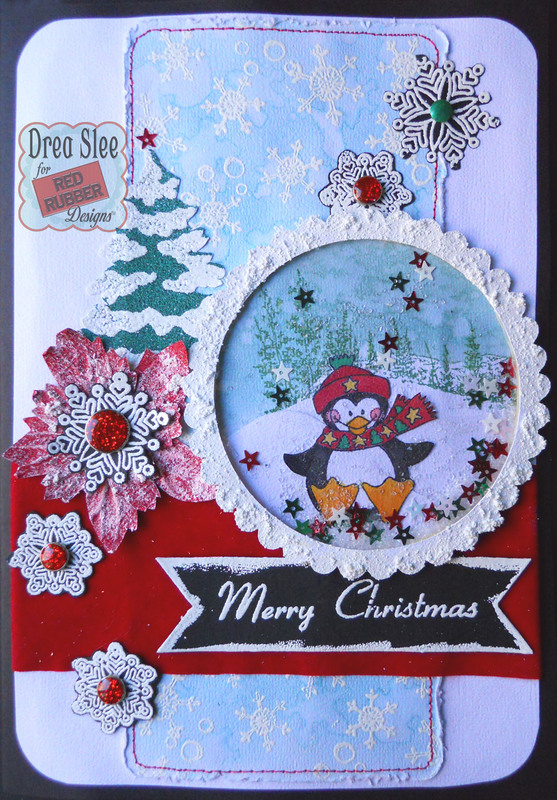 The sentiment was embossed in white, and can also be purchased in the cling mounted Vintage Christmas version, which also includes the snowflakes that I stamped in black. 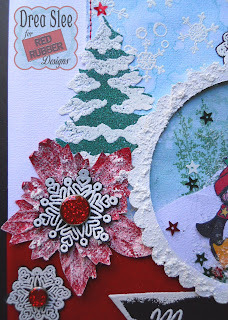 Each card has some bling on the snowflake, and different striped ribbons. If you're really pressed for time, forego the sprayed Santa's note and use cardstock instead, like I did on these two cards using the greens from the DCWV Neutrals 8 X 8 Cardstock Stack. My favorite is this one with the sprayed green Santa letter! Hi there! 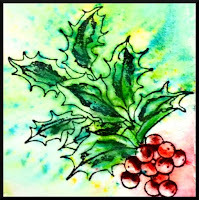 It's December 1st and now the countdown is really on to get those Holiday cards finished and mailed! Today I am featuring the Holiday Wreath Unmounted Rubber Stamp set. I love this set which is a fabulous value and comes in unmounted and individual wreath sets in cling mount. I have posted pictures and all the links at the end of this post! 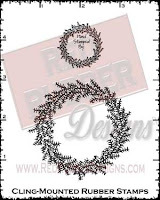 The Holiday Wreath Rubber Stamp set is a favorite of mine because of the variety and versatility in this one set! 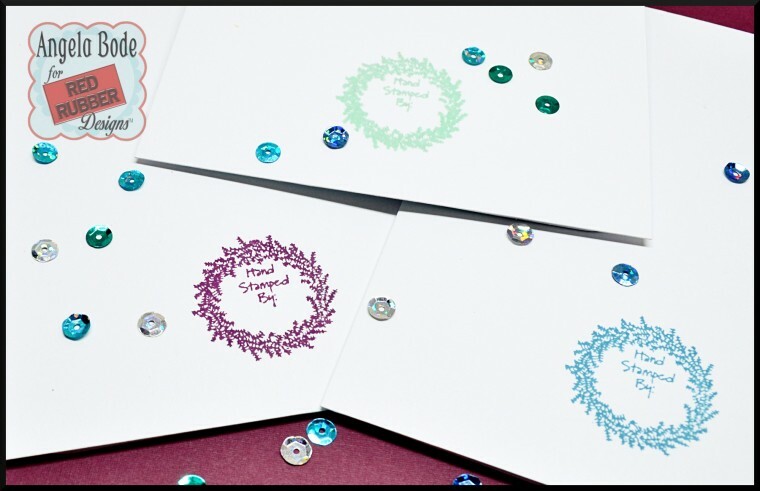 A lovely greeting is included which can be used on the front of a card or can be featured on the inside! I stamped the holiday greeting in coordinating colors and adhered the layer to the inside of the cards. Also included in this set is the cutest little watermark stamp which can be used to personalize your one-of-a-kind Christmas gift!! 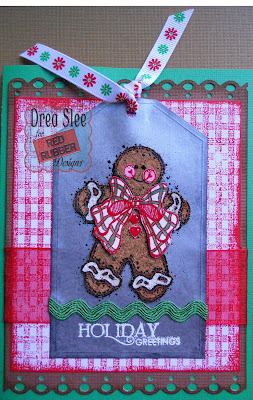 I stamped the little "hand stamped by" wreath on the back of each card in coordinating colors. I love the versatility of this stamp set as wreaths can be used for a variety of occasions! Last week I created this "thankful for you" card with the Pine Wreath (which is included in the Holiday Wreath Rubber Stamp set and also as a set of three stamps in cling mount). Thanks so much for stopping by for a bit of inspiration today! SALE EXTENDED DUE TO POPULAR DEMAND!! 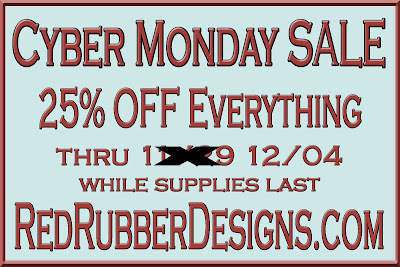 SHOP NOW at RedRubberDesigns.com now thru 12/04! SHOP NOW for 25% OFF EVERYTHING! Happy Thanksgiving! Now it's time to get started on your Christmas cards, if you haven't already. 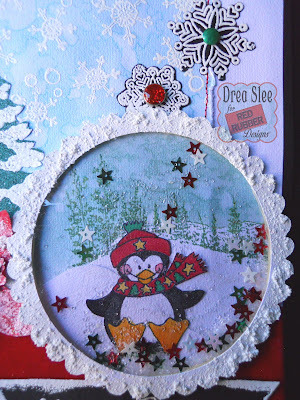 Since my son loves penguins, I made him a shaker card featuring the Mister Penguin Unmounted Rubber Stamp Set, from Red Rubber Designs! I started my shaker by cutting the scallop frame with my Cricut Expression, and covered it with Snow-Tex. Once dry, I glued a piece of clear acetate behind it, and added a thin frame of double-sided adhesive foam tape to enclose the glitter. The background was stamped with the Mountain Scenery Unmounted Rubber Stamp Set, and embossed with glitter. Then I colored the sky with some Distress Inks and water splats. The adorable penguin was colored with markers and Distress Inks, with some shimmer from A Wink Of Stella on the cheeks, and black and white parts. Finally, I placed him over a couple of snowy hills covered with Stickles, added some Diamond Dust and metallic stars, and adhered it to the acetate frame. 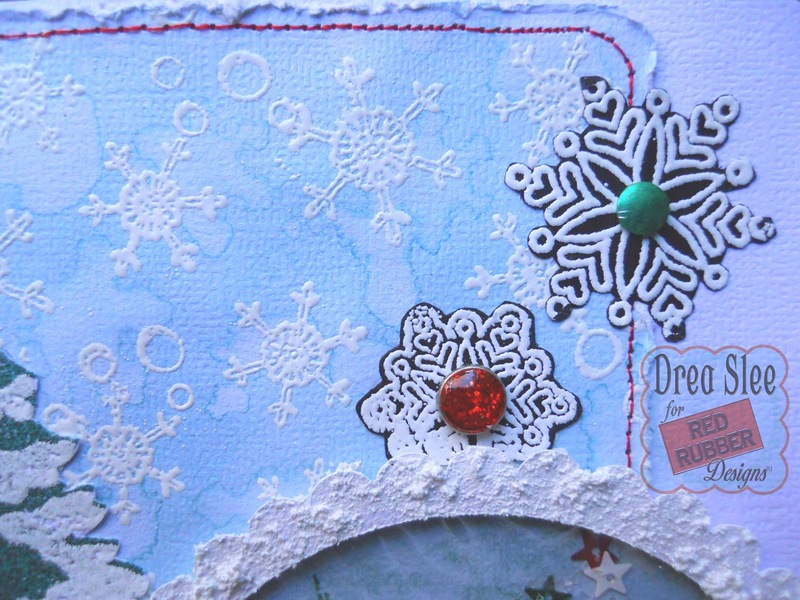 I made the snowflake paper with a strip of white cardstock, colored with Distress Inks (Tumbled Glass and Broken China), and my blending tool. Then I spritzed the back of my snowflake and circle stamps, from the Vintage Santa and Cheery Christmas Unmounted Rubber Stamp Sets, with some water and pressed them all over the background. 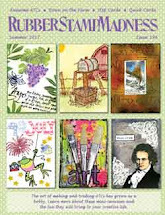 Once dry, I embossed the same stamps in white, and machine stitched the distressed edges. I used the Cheery Christmas stamp again to emboss the other snowflakes onto black cardstock, fussy-cut them, and added some sparkly brads to the centers. The tree was embossed in two steps, using the Oh Christmas Tree Cling Mounted Rubber Stamp Set, and topped off with a metallic star. 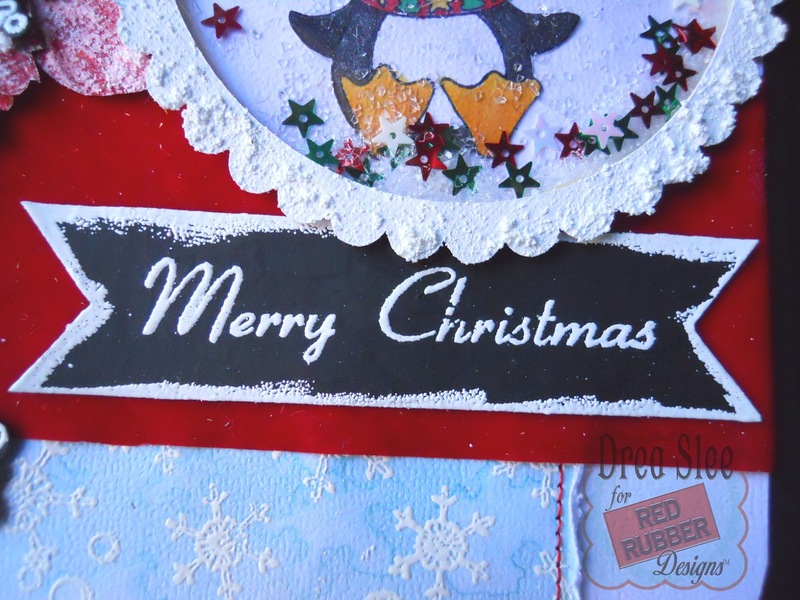 The sentiment was embossed with the Vintage Santa Set, onto a banner of kraft board, covered with black gesso to look like chalkboard. 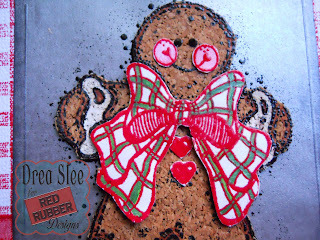 I love the contrast against the sparkly red strip of velvet ribbon! I can't wait to give this to my son, and see him shake it! Thanks for looking! Hello, friends! 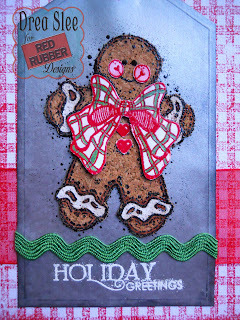 Red Rubber Designs has a wonderful variety of holiday stamp sets along with sets for every occasion! 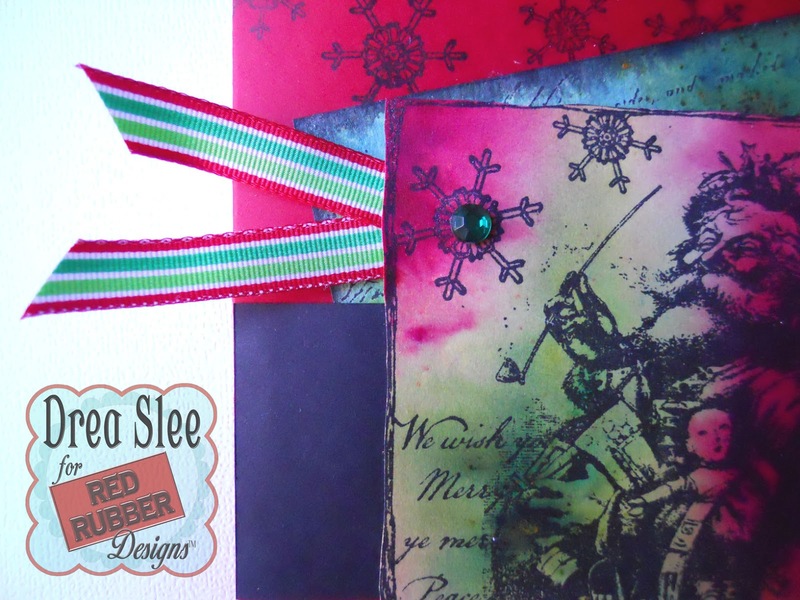 Christmas is one of my favorite themes when creating, so today I am featuring the "Glorious Holiday" stamp set which can be purchased as an unmounted rubber stamp set or cling mount rubber stamp set. I stamped the holly image with water resistant ink then direct to paper stamped distress inks on the image and spritzed with water. Although it was fun to watch the ink spread, the color wasn't as vibrant as I wanted so I pulled out the Brushos powders. I sprinkled on the powders and once again spritzed with water then I added a little more pigment with a brush where I wanted a deeper tone. Leave me a comment below and tell me what you have created so far for your holiday/winter stash, I would love to know!! !